The wave of euphoria from USB and Firewire devices has subsided. Typical shortcomings of external interfaces include low functionality value converters, weak analog section, slow response, and stability issues in certain hardware configurations. All these often outweigh seeming advantages of the external design and hot plugging. At the same time, manufacturers do not intend to give the market to external interfaces. They offer PCI/PCIe expansion cards with a better price/quality ratio. Infrasonic Quartet is one of such solutions, which is designed to replace an external multi-channel interface with microphone and other inputs/outputs. 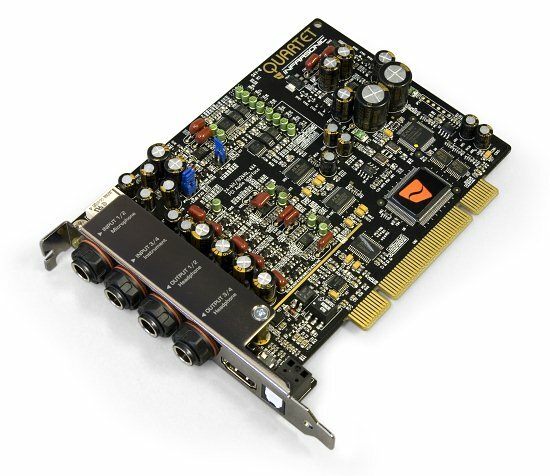 Owing to its functionality, the Quartet also competes with a traditional sound card with an external mixer. The Infrasonic Quartet actually develops the idea of the four-channel Audiotrak MAYA44 card, which evolved to the ESI MAYA44. The Quartet is based on the same configuration as the MAYA44 - 4x4 analog inputs. It also uses a stereo jack, TRS, unbalanced, -10 dBV. So you can easily plug headphones and consumer electronics through a stereo mini-jack adapter. One line-in can be switched to a mic preamp mode with +48 V and a low cut filter (75 Hz). The other can be used as a guitar input. Both line-outs are equitable. They can be used for headphones without switching to the low-impedance mode. Strong hardware points of the new product also include new promising converters (AKM AK4620B). We've already seen them in the ECHO Audiofire 4 and RME Fireface 400. The AK4620A is positioned for professional sound cards, DAW, and other equipment. The codec supports up to 24-bit 192 kHz for recording and playback. 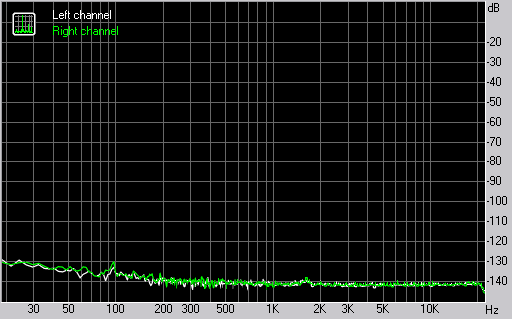 Signal to noise ratio is 100 dB, dynamic range - 113/115 dBA. 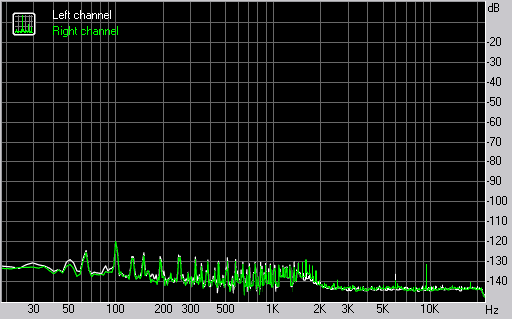 Noise spectrum of PCI sound card depends on interferences that come from power lines, grounding problems, and other factors. The manufacturer of the Quartet card speaks of using a proprietary 'US-PSB class I' technology (Ultra Stable Power Supply Block) to filter power supply. It's based on OP-AMP discrete circuits instead of a general regulator type IC. In addition, it has the function of slowly rising voltage, called 'Slow slope ON'. This protects monitor speakers and headphones from being damaged by that "pop-noise" when you turn on your PC. Noise Guard Bracket is used to protect QUARTET from electronic noise that the computer and other PCI/video cards can generate. I doubt it - cards without such protection demonstrate similar results. It's a decoration rather than a functional element. Besides, it adds rigidity to the card. Unusually-looking output connectors have threads and come with plastic nuts, which fix the card in a PCI slot and prevent possible switching problems. Note the WordClock BNC connectors, which allow to sync the card with other devices. Besides, the adapter also has S/PDIF and MIDI interfaces. Phantom power applied to MIC-in lights a yellow LED on the bracket near the input connector. At the same time, the lack of +4 dBu and balanced connectors reduces the professional value of the card and orients it towards home studios and a wide range of general tasks. For example, the card offers an opportunity to connect speakers and headphones at the same time without using an external mixer or replugging cables. The control panel traditionally tries to place all settings on a single screen. You can adjust a volume level of output channels and a monitoring level at 0.5 dB steps. You cannot specify these levels manually. At the same time, a peak meter shows a signal level accurate to within 0.1 dB. One of the main advertised features of the card is FREE Mixer. FREE stands for Flexible Routing Enhanced Engine. 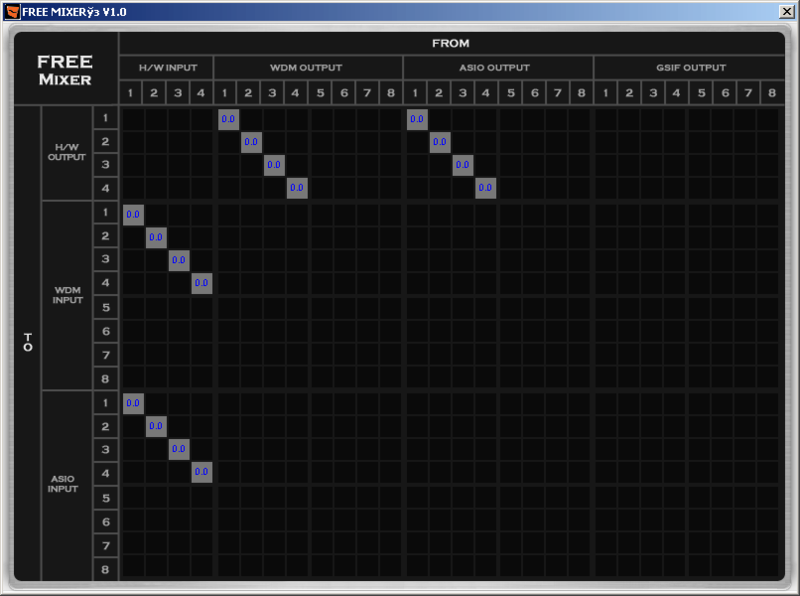 There are 8 I/O mono channels to ASIO and WDM interfaces. You can route a signal to other virtual channels and physical ins/outs, and adjust its volume in a submix. Perhaps, the technology will show its worth with many channels. As for now, it's just an interesting feature, a development of the DirectWire idea towards professional usage. We cannot help comparing it with TotalMix of the RME audio interfaces. The latter has much more channels, which significantly raises its value - you can create a sterling submix. You can control levels not only in a regular mixer, but in the matrix itself, which is much more convenient. Important note! The driver for Vista did not include FREE Mixer, when this article was written. The Infrasonic Quartet card was connected to the input of the LynxTWO in order to determine potential quality of its analog output. You can add 1.5 dB to these results, because we had to reduce the signal level by this overhead value to coordinate with the standard -10 dBV level of the Lynx. 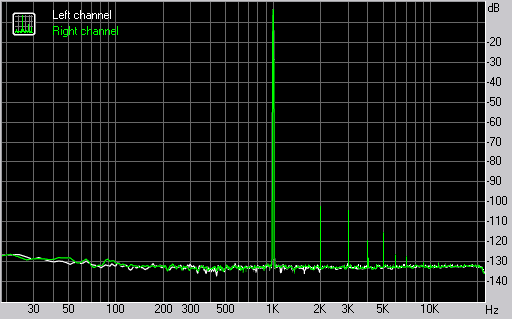 So we get 110.2 dB signal/noise - it's an excellent result for a non-balanced connection with a consumer signal level! No doubt, we would have got better results with a +4 dBu balanced connection. Such high absolute results do not mean much, but they demonstrate the circuitry class. Noise spectrum does not show any signs of interferences, when there is no signal. In order to test the power filtering technology, we replaced the Infrasonic Quartet with the X-Fi Elite Pro (top model, $300), which officially offers impressive 116 dB signal/noise owing to the flagship DAC CS4398 and the adequate analog section. Although we get similar integral results, the Creative spectrum is less pure. Even such a spectrum is an excellent result, of course. You cannot make out noises below the 16-bit sampling level, which have nothing to do with the signal. The harmonic spectrum in the distortions test is typical of AK4620B-based devices. It matches the official values published in the specifications with 'Audio Precision'-logoed spectrums. But in this case we expected much worse results, as line-out can work with headphones. It may require a powerful op amp and other additional elements, which cannot possibly improve quality, to put in mildly. Fortunately, measurements show that everything is all right here. The final word will be said after audition. Audition of the Infrasonic Quartet connected directly to the ADAM S2.5A shows its high professional quality. It demonstrates natural tones, normal attack and stereo panorama. We've compared our card under review with the Juli@ and E-MU 1616M. Differences between these three devices are very small. The Infrasonic Quartet is at least no worse than the Juli@ with a balanced connection. The author still prefers the E-MU 1616M. We should take into account that if the differences are insignificant with high-quality monitors ($5000 per pair), budget speakers will reveal no differences, no matter how much you want to hear them. We tested the headphones output with the Beyerdynamic DT-250 (80 Ohm) and Sennheiser HD600 (300 Ohm). Audio volume in the headphones is sufficient with the -5..-6 dB output level, so you can even make the sound louder. We compared the headphones amplifier of the Quartet with the one in the Behringer UB502 and the E-MU 1616M microdock. We didn't notice much difference in the good sense of the word. We've heard no LF losses. The Quartet sounds naturally, adequately. The UB502 mixer offers the best volume margin. The cost of ESI Juli@ + inexpensive mixer compares to that of the Quartet, or even higher. Besides, the Infrasonic card lacks a handy volume control and mixer. In return, it offers phantom power and twice as many channels for recording and playback. Infrasonic Quartet is a very interesting card with a good market potential. It's inexpensive and functional and will be an optimal solution for many users, who want a device for <$200. Target audience of this card is home musicians and audio enthusiasts, who need an easy to use device.